José Saramago, Nobel author, Communist, mourned in Portugal | Cuba Headlines – Cuba News, Breaking News, Articles and Daily Information Saramago was born in 1922 into a poor peasant family. He worked as a mechanic, proofreader and journalist for decades before fully turning his attention to writing. Indeed, he only began to receive recognition for his literary work when he was in his mid-50s. "> Saramago was born in 1922 into a poor peasant family. He worked as a mechanic, proofreader and journalist for decades before fully turning his attention to writing. Indeed, he only began to receive recognition for his literary work when he was in his mid-50s. José Saramago, militant Communist and Nobel Prize winning author, died last Friday at his home in the Canary Islands. He was 87 and lived with his wife, the Spanish journalist Pilar del Río, in exile from his native Portugal since 1992 after political and religious opposition to his book "The Gospel According to Jesus Christ," in which the title character apologizes for the sins of God. An estimated 20,000 mourners, including Portugal's Socialist prime minister, José Sócrates, and Jerónimo de Sousa, leader of the Portuguese Communist Party (PCP), attended his funeral in Lisbon on Monday. According to the BBC, "At the end of the service, the coffin, draped in a Portuguese flag, was lifted, to applause, before Saramago was cremated at a nearby cemetery." Notably absent was Portugal's right-wing president, Anibal Cavaco Silva. At the funeral, Maria Teresa de la Vega, the deputy prime minister of Spain,said Saramago "dreamed of a world in which the strong ones would be fairer and the fair ones would be stronger." A member of the Portuguese Communist Party since 1969, Saramago won the Nobel Prize in Literature in 1998 for his "parables sustained by imagination,compassion and irony," in the words of the Swedish Academy. The Vatican opposed this recognition, calling Saramago - surely to his delight - "an unreconstructed communist." Even at his death, the Catholic Church termed Saramago a "populist extremist" and "an anti-religious ideologue," the BBC reported. Contrary to this kind of simplistic and reactionary venom, Saramago was an original, critical Marxist thinker, challenging us to constantly develop theory and practice. In a 2008 interview with Political Affairs, for example, he explained, "For many years the error of the Marxist left has been to think that the weapons of the past will always serve to win the battles of the present." Saramago was born in 1922 into a poor peasant family. He worked as a mechanic, proofreader and journalist for decades before fully turning his attention to writing. Indeed, he only began to receive recognition for his literary work when he was in his mid-50s. Saramago, like many leftists, lost his job - at the time, as deputy editor of the newspaper Diário de Noticias - after the 1975 coup against Portugal's Communist-led revolutionary government. Saramago once said, "Being fired was the best luck of my life," according to an obituary in the UK Guardian. "It made me stop and reflect. It was the birth of my life as a writer." Among his most celebrated novels is "Blindness," published in 1995, the story of a nation which loses its eyesight, a metaphor for the greed and corruption of capitalism. A film version was made in 2008 by the director Fernando Meirelles. Saramago's 1984 book, "The Year of the Death of Ricardo Reis," set in late 1930s fascist Europe, is widely considered to be his masterpiece. English translations of Saramago's final novels, "The Elephant's Journey" and "Cain," will be published later this year. 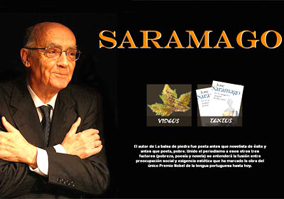 From September 2008 to August 2009, Saramago maintained a daily Internet blog called Outros Cadernos de Saramago. It was his wife's idea and, although reluctant at first, Saramago found the Internet "that place where I can most express myself according to my desires." The entries, which covered topics as diverse as the election of Obama, life in Lisbon, and his favorite authors, were compiled and published earlier this year as "The Notebook." In the collection,Saramago famously describes one of his favorite targets, George W. Bush, as "the high priest of all liars." Saramago was "known almost as much for his unfaltering Communism as for his fiction," as The New York Times put it in its obituary. He wrote regularly on issues of human rights, the crimes of capitalism, and the hypocrisy of religion. In recent years, Saramago was a vocal and often maligned critic of Israel. For instance, he joined many other progressive intellectuals in condemning Israel's war against Lebanon in 2006, a component of what they declared "a long-term military, economic and geographic practice whose political aim is nothing less than the liquidation of the Palestinian nation." In an official statement, the Portuguese Communist Party said that Saramago's "death represents a loss for the entire Communist Party collective - for the Party which he chose as his own until his final days." It recalled his role as an active participant in the restoration of democracy in Portugal as well as his "remarkable and unique literary work." "José Saramago's intellectual, artistic, human and civic stature," the PCP declared, "makes him a major figure in our history."